Warm sun shines on your face. You turn to see a giraffe munching on the leaves of a nearby tree. Zebras graze in the distance. It might be any summer day at your local zoo, but it’s not. It’s January, and you are in Africa to climb a mountain. Mount Kilimanjaro is a dormant volcanic mountain in Tanzania, Africa. It is the tallest free-standing mountain in the world at 19,341 feet. During a climb, hikers pass through five climate zones from equatorial heat to arctic ice and snow at the peak. However, sometimes even people in good shape don’t make it because they have not prepared for the high altitude. “I trained by increasing my personal workouts and wearing a 20 pound weight vest and an elevation training mask while walking on the treadmill,” says Mark. The mask simulates a high altitude environment by restricting airflow. It took seven days to climb the mountain and two days to come back down, and it was uncomfortable. 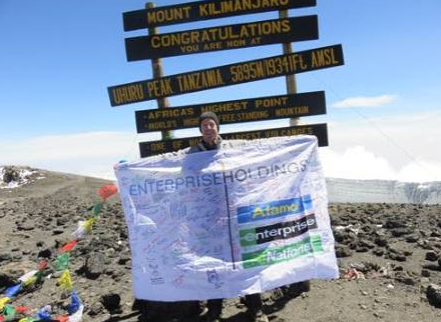 “It was really exciting to ‘take’ 100 of my employees to the summit with me,” says Mark. The Enterprise flag is now framed and hangs in the administrative offices at the Los Angeles airport.